If you are searching for a flooring solution that will cope with the most demanding situations in style, as well as being durable and easy to clean, epoxy flooring is for you. Epoxy flooring is a coating suitable for heavy duty industrial areas, commercial buildings, and even for at home. Applied over concrete, it is perfect for fixing up the old garage floor. Epoxy is a liquid which dries over time and leaves a clean equalized surface. Although epoxy flooring is resistant to almost anything, there is an exception: UV radiation. Because of this, epoxy flooring is mostly ideal for interiors, not areas with high levels of sunlight. The floor is also likely to suffer damage from impact, so heavy items dropping on the floor may lead to the need for repair. The most important part of any epoxy flooring application is the preparation of the substrate. The epoxy needs a completely clean and clear surface to adhere to, so it is important to make sure that any cracks or chips in your floor are repaired before you start. Make sure the surface is dust and dirt free and is not stained with grease, oil, or solvents. If it is, you will need to clean these. The concrete must be completely dry before application. 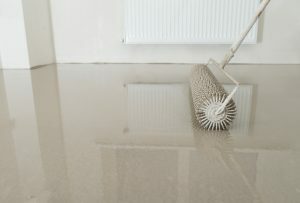 Once all the prep is done, you can begin to apply your floor. Make sure you follow the instructions on the package of the product you use. Depending on the epoxy you may need a roller or brush, or it could be a self-leveling epoxy. A minimum of two coats is recommended. The smell of epoxy is strong, so wear appropriate safety clothing, gloves, boots, overalls, and a respirator. Looking for a really special floor? Do you want to have your floor coated with epoxy? But do you also want to have a great-looking design with 3D effect? 3D epoxy flooring is a new trend, growing very fast in India. Do you wish to know more? Click on one of the links below. Do you need help finding the right epoxy flooring specialist in India?